Another hectic week at work had me worrying that I wouldn't get these three done in time, in fact as I post this the gore is still a little fresh! Still, finished they are and just in time - I present three more additions to the horde in the shape of these 'Mirliton Miniatures'. Not a company, I am particularly familiar with, these were in fact a generous addition to lead pile from that splendid chap and good friend, the 'Provost Marshal'. They have a wonderful old school feel to them and were beautifully cast, requiring very little preparation at all. The nondescript and tattered clothing gives them an aged look and coupled with their emancipated torsos they certainly look as if they were some of the first to be infected. Because of this, I'm thing that I might be able to double their usefulness and have them as part of the seemingly ill-fated 'Withfinder General' project. Wet gore looks the best anyway :). May I ask what recipe you're using for the rotting flesh there? It's a very effective greenish tinge which I may well steal. Thank you Herbert, as for the recipe the paints used were all Vallejo Model Colours and started with a base coat of Japanese Uniform WWII, into this was mixed some German Cammo Beige and finally a highlight of Light Sea Grey was added to the mix; I hope that helps. Nothing like a deadline to get you painting! Lovely figures as ever Michael. I couldn't agree more, but my word it comes round a bit quickly! Very nice work. It seems quite rare to find proper decaying zombies! Thank you Chris, certainly different and I haven't really seen any as decayed as this before. Cool miniatures, and I'm liking how you've painted them. Great effort Michael they look superb! Thank you Simon, they were just a bit different so glad to get them done. They look gorily good Michael! Thank you, they are wonderfully decayed and the gore just seemed to lift them a bit. Thank you J.D., they really have a bygone look to them - almost classic. Ragged and gory, proper zombies! Thank you Bob, I do like a bit of gore on my zombies. Superb painting Michael, you have really brought these to life.......well sort of. Than you Ian, I went for a more rotting corpse look. Thank you kind Sir, they are rather rotten aren't they? Really nice. Every zombie horde needs a good range of decay levels...and these fit neatly into that awkward 'long-time-dead-but-not-yet-losing-parts' phase. Thank you Kieron, really kind of you to say so and they certainly fit that 'long-time-dead-but-not-yet-losing-parts' phase. Some top notch rotting/raggedy zombies there. Love the skin-tone. old-school. They likely first saw the light of day back in the 80s. Hmmm, You young whipper-snapper - you may be slipping off the Christmas card list Sir (SMA on the other hand is always up there near the top of the list). I actually bought these last year as I needed something to fill out an order (Murat and Bessieres amongst them). If you haven't checked out Mirliton, they are an Italian company who do some very nice medieval figures and accessories, though at 25mm, some might not match big 28s. Absolutely disgusting. Well done mate! I'm glad That I don't live in or near the town these "Bloody Bones" frequent. I'm not sure anyone does these days, it looks like they haven't eaten in a while. Disgustingly good Michael! Excellent work! Great look and great paint Michael . Thank you and glad to be of assistance. 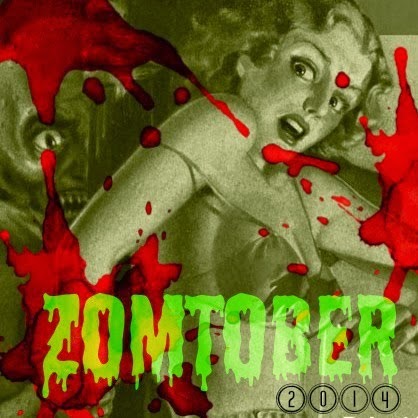 Lovely work as always ^_^ ... What pray tell is Zombtober, pardon the ignorance. Another batch of grisly goodness Michael. You have the wet blood down to a science. Thank you Terry, the wonders of Tamiya clear red never fail. Bloody and beautiful...how can you do that? It is down to the quality of the sculpt, but thank you. These looking stunning chap and as always your painting technique brings the best out in them. No! Not ill fated please I've been waiting for it for some time now. The Mirliton figures are very old school looking and they are beautifully painted.